Every year I participate in a gift exchange with the other moms on my mom’s mailing list. This year we decided to exchange gifts for each other; we had been doing gifts for the kiddos (gift vest). It’s one thing to make a long distance vest for a child and quite another to fit a woman who (in this case) doesn’t know how to use a measuring tape. So, I decided to try my hand at making a bag. I’d seen advertisements for Barbara Randle’s Crazy Quilting with Attitude book, and I watched the her guest appearance on Sewing With Nancy. At the time, I didn’t think I’d be making bags. When I decided to make this bag, I didn’t have time to purchase the book, so I winged it. I strongly encourage anyone who is interested in making bags to give it a try. It wasn’t hard, and I think I made a useful durable bag. 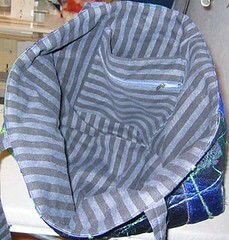 My bag has a zipper top, shoulder straps, is fully lined, and has 2 interior pockets between the lining and the bag. I have a quilting ruler that is 12.5 inches by 12.5 inches, so I decided that would be the size of the sides of the bag including seam allowance. 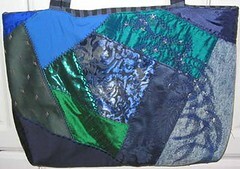 I looked at some of the canvas totes that I have, and decided to make the finished sides of the bag 6 inches wide. The straps were more problematic. I don’t know how tall my giftee is. First I tried carrying my canvas totes on my shoulder and decided that the straps were too short. I made the straps a comfortable length for me to carry, and since that was before Christmas, I’ve forgotten how long that was. I think it was 36″, including seam allowance. I made the straps the same width as my canvas totes. The fabric was cut at 5 inches. I used a 1/2 inch seam allowance, sewed the long strips into a tube, and turned the tube, producing a 2 inch wide strap. I pressed the straps with the seam at one side because I wanted to embroider them down the middle, and embroidering thru 4 layers of denim is difficult. I had been thinking that the proper place for the seam would be the center of the back of the strap. However, in retrospect, I think the seam is least visible on the side, and it’s certainly easier than trying to center the seam while pressing. I was using the picture on the cover of Barbara Randle’s book as my inspiration, and I think my bag does look like the picture, if toned down a little. I really liked the striped piping and side fabric in the picture. I didn’t have time to make piping, and after I’d purchased the book, I found out that Ms. Randle purchases the piping ready made. I think I did a good compromise using the striped denim. Since I was making it up as I went, I found the instructions very easy to follow. Choose a sturdy base fabric like heavier denim or canvas. I was going to use interfacing, but after looking at my canvas totes, I decided the denim didn’t need it. Choose a feature fabric. 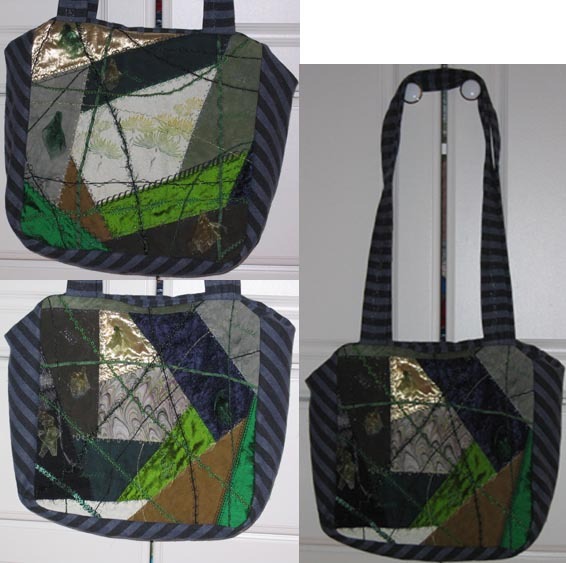 In my purse, the feature fabric is the dandelion print in the center of the upper left hand image. The background color is a light sage green. This fabric is from an antique, silk kimono. Choose coordinating fabrics. I chose the rest of the fabrics to coordinate with this one and the denim. 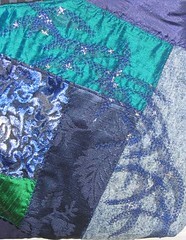 There are quilting cottonsl, hand-dyed cottons, panne, lame, and dupioni silks in the crazy patch. Cut sides bigger than finish size to allow for shrinkage. 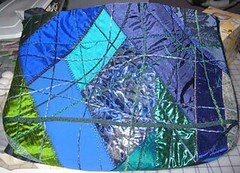 Use decorative stitches on the seam lines. In addition to being pretty, this step helps to reinforce some of the weaker fabrics. It is my intention that the denim base take the stress load, but I think that the dupioni fabrics will be the first to show wear. Couch pretty fibers. I use a decorative thread in the needle, not monofilament. I don’t find that it obscures the yarns. Square sides. My sides shrank, so with seam allowance, my sides were 12 inches. Round corners of sides. I used a coffee cup to determine the curve. Cut end/bottom fabric. I cut my denim on the bias, mostly to get the diagonal stripes, but it also made sewing around the corners easier. I used one big piece. Cut & construct lining. I made my lining bigger than my bag. I’ve had lined bags where the lining shredded because it was carrying the load, not the bag. I figured if the lining was larger than the bag, that won’t happen. My lining was made up of 5 pieces, 2 square sides, 2 rectangle ends, 1 rectangle bottom. Insert zippers into large sides of lining. Cut pockets larger than lining sides and ease to square sides of lining. This would be much easier to do before you construct the lining. Insert lining into bag, WST, and sew around top. Finish the top seam. The seams that are hidden by the lining don’t need to be finished, but the threads from the top could get into the bag and be an annoyance. It also made working with all the layers easier. Construct the top. I made my top from 4 pieces of the striped denim with a zipper. I probably won’t do it this way again because I had to match the denim stripes. I don’t know how to put a zipper in a bag, so I made this up as I did it. Construct the straps. Embroider the straps. Turn bag inside out. Baste straps into place. Sew top to bag. Turn right side out thru zipper hole. It was really easy to sew the bias denim around the rounded corners. I hope the denim doesn’t stretch too much. 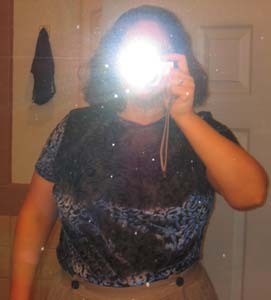 Primarily a heavier denim (base on sides, on the bias for the ends, pieced around a zipper for the top, and the straps). 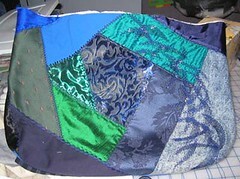 Antique kimono fabric, dupioni silk, quilting cottons, hand-dyed cottons, panne, and tissue lame for the crazy patch. The lining was a polyester lining fabric. 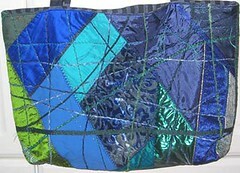 I also used polyester, rayon, and metallic embroidery threads, and yarns of vaious materials. I might make one of these for myself. This was the first time I coveted something that I made as a gift. I mean, I always like what I make, but I embroidered the giftee’s name on this one so that I had to give it away. Everyone on the mailling list raved about it, so I think I’m on the hook to make more. This is a great gift, easy and quick to make. I highly recommend it.